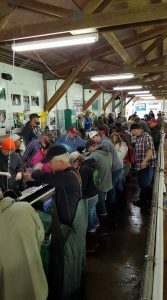 It all started in 1987, when the Oregon Department of Fish and Wildlife held annual fundraiser for the backyard “fish hatchery” program – STEP – Salmon, Trout Enhancement Program in Tillamook County. One of the organizers, former Tillamook County Commissioner Jerry Dove, an avid outdoors and fishing supporter went around gathered up lots of great items. “I knew that we were going to raise more than they needed for the STEP program, so I asked ODF&W where the ‘extra funds’ would go,” explains Dove. “And they said ‘the general fund.’ Well, I headed right to the bank to set up a local group, ‘Tillamook Anglers’. We got our nonprofit, and we were off and running,” chuckles Jerry. Three million smolts and 30 years later, on Saturday April 13th volunteers will descend on Whiskey Creek Fish Hatchery to make short work of “clipping” 100,000 salmon smolts. “Fin-clipping” is a way to identify hatchery-raised fish that can be caught, retained and enjoyed by local fisherman. The salmon smolts reared at Whiskey Creek are headed to the Trask River and help supplement the run on that Tillamook County river. Located on Netarts Bay, two miles north of Cape Lookout State Park, Tillamook Anglers has operated the hatchery since 1988. The organization has completely renovated the property, removed and replaced the rearing ponds with modern concrete ponds and a modern enclosed facility was erected with an incubation room, work room, storage area and classroom/meeting area. The caretaker residence was renovated and the grounds were improved to a park like setting. The 30th annual fin clipping on Saturday April 13th begins with coffee and doughnuts at 8 am, a demonstration of the clipping, and gets underway at 9 am. It may seem like a daunting task to “clip” the fin of 100,00 small salmon smolts, but “many hands make short work.” The help of hundreds of volunteers speeds the process, and volunteers are welcome to come at any time. “No experience necessary. We can show folks how to clip in about 10 minutes, and then when someone else wants to take a break, we can put them in a slot. It’s a well-oiled machine,” said Jerry. There’s a silent auction of items, Tillamook Angler swag, some of the “leftovers” from the epic outdoors equipment garage sale, and of course the barbecue lunch. Tillamook Anglers is a nonprofit organization of like-minded anglers dedicated to raising fish and improving fish and fishing on the North Oregon Coast. People that like to catch fish, and are supportive of preserving fishing resources, men and women of all ages and walks of life, willing to donate time, effort and resources to enhance fishing opportunities. Tillamook Anglers has received support from a variety of grants, and major donors, including the Loren Parks Foundation. The current board includes Jerry Dove, president; Jim Young, Vice President; Jim Devine, treasurer; B.C./Brent Collier, Secretary; Dave Hanson, hatchery; Dave St. Laurent and Tom Stumpf. 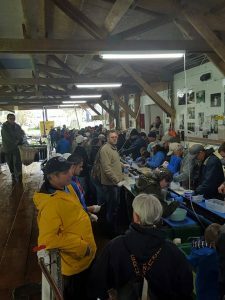 Join Tillamook Anglers on Saturday April 13th from 9 am to 2 pm for the 30th Annual Fin-clipping event at Whiskey Creek Volunteer Fish Hatchery. There are plenty of other volunteer opportunities with Tillamook Anglers: hatchery volunteers and fish feeding; salmon smolt release; spawning Chinook and coho salmon; surplus hatchery salmon to the Oregon Food Bank; stream enhancement – OR, become a Tillamook Angler member. Tillamook Anglers also provide a fishing day for children with disabilities the second Saturday in September (September 14, 2019). As many as 600 kids attend and catch up to four rainbow trout. Hundreds of volunteers are needed to assist with cleaning and preparing the fish for the trip home. For more information about Tillamook Anglers, contact Jerry Dove at jdovetillanglers@gmail.com or 503-842-6519.